Located upstairs in the Denver Pavilions at 16th St. and Glenarm Place, Lime is a hot spot for authentic, Southwestern flavors with a great “locals” Tequila bar. In true cantina style, the wide-open dining area just beyond the bar, which has high ceilings and a contemporary industrial feel, is brightly lit and humming with customers. Great outside patio for those warm summer days. I had the grilled chicken soft tacos which were light and loaded with fresh avocado. 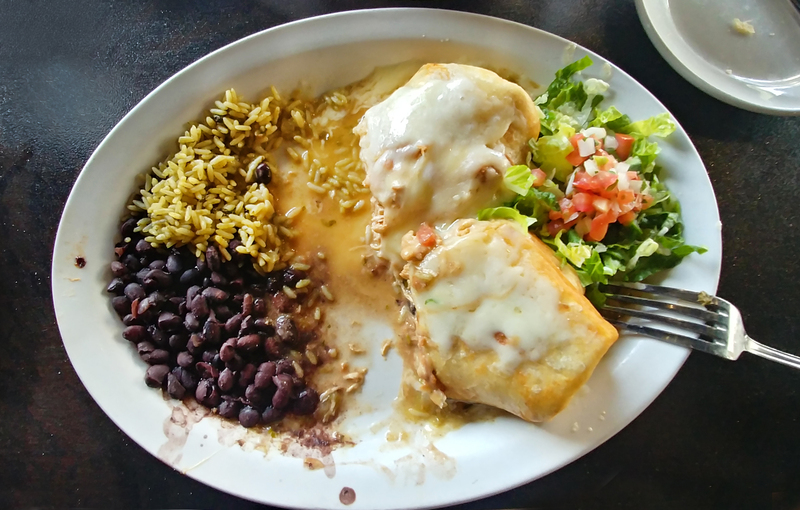 My lunch partner let me try his Chicken Chimichangas with a side salad, black beans and rice, and covered in Select New Mexico green chile. Yummmm! Nice too that our food was delivered quickly so we could get on with our meeting and be back at the office in no time. Monday and Wednesday through Friday Happy Hour specials include $3 house Margaritas, $4 frozen Margaritas, $3 well and wine, $3 drafts, and $3 appetizers. Check it out on Tuesdays for $1 tacos, $5 Sauza House Maragritas, and $4 Sauza shots. All day Happy Hour Thursday gets you $5 Mojitos!